Are looking for quality self-catering accommodation, with easy access to the centre of Birmingham and adjacent to the National Exhibition Centre? Do you need a "home-from-home" while on business in the Birmingham area? Fed-up of spending days and days in hotels? 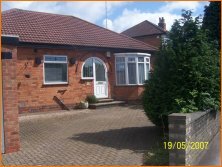 We are pleased to offer this quality bungalow for weekly lets. The bungalow is detached, has three bedrooms, a fully-fitted kitchen, a utility area with washing machine, bathroom with a bath/shower, a T.V. lounge, and a dining area with table and six chairs. Wi-Fi internet is also available. Parking for three cars and ¼ acre landscaped garden. The Bungalow is ideally situated close to The National Exhibition Centre, N.I.A, Birmingham Airport and Birmingham International train station. It is within walking distance of Sheldon shopping precinct, with restaurants, pubs, balti houses and take-aways all close by. Birmingham has an excellent bus service, with a stop just outside the Bungalow, giving easy access to Birmingham city centre and nearby Solihull. There is also a swimming pool and leisure centre within easy access.